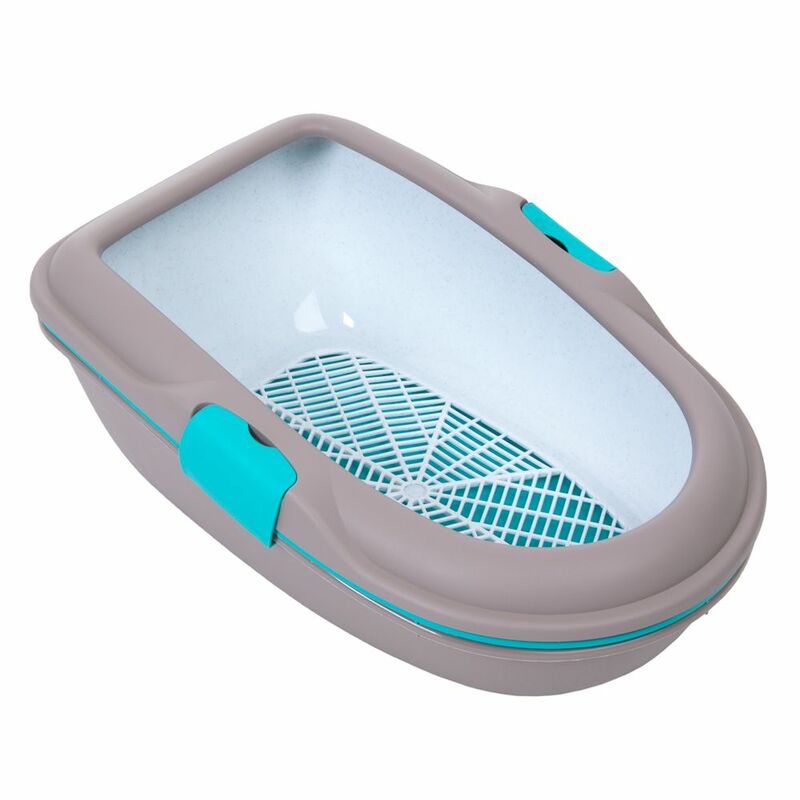 The Trixie Berto Cat Litter Tray is particularly practical and hygienic, offering easy cleaning thanks to its dividing system with two trays and a handy sieve. When you need to clean your cat's litter box, simply remove the upper tray and fill the sieve with the litter. Any soiled litter clumps and stool pieces are collected in the sieve, with its 6mm openings, with any clean litter filtering straight through. This clever, reusable system ensures economical litter use. The removable frame of the Trixie Berto Cat Litter Tray is fastened securely to the tray with a simple Easy Click system. It helps to prevent litter from falling out of the tray and making your home dirty or meΒy, ensuring optimal cleanlineΒ and hygiene around the litter tray. The low entry height and large dimensions make this Trixie Berto Cat Litter Tray perfect for any size of cat that prefers a claΒic litter tray. The modern look in trendy turquoise and taupe colours makes an attractive addition to any feline household. Trixie Berto Cat Litter Tray at a glance: Litter tray for cats of all sizes Hygienic dividing system: with two trays and a sieve Easy and quick to clean: sieve the litter to remove stool and clumps but keep clean litter Economical litter use: the sieved litter can be reused With easy click fastenings: to ensure a strong connection between tray and frame CleanlineΒ: the removable frame prevents litter and dirt falling out of the tray and making your home unhygienic Modern design: stylish colours and appearance Colour: turquoise, taupe, granite Material: plastic Dimensions: Total dimensions: 59 x 39 x 22 cm (L x W x H) Inner dimensions: approx. 57 x 37 cm (L x W) Front entry height: approx. 16cm Rear tray height: approx. 23cm Inside edge overhang: approx. 4cm Sieve openings: max. 25 x 6mm.